What is. Universal Credit. & how will it affect me? Download "What is. Universal Credit. & how will it affect me?" 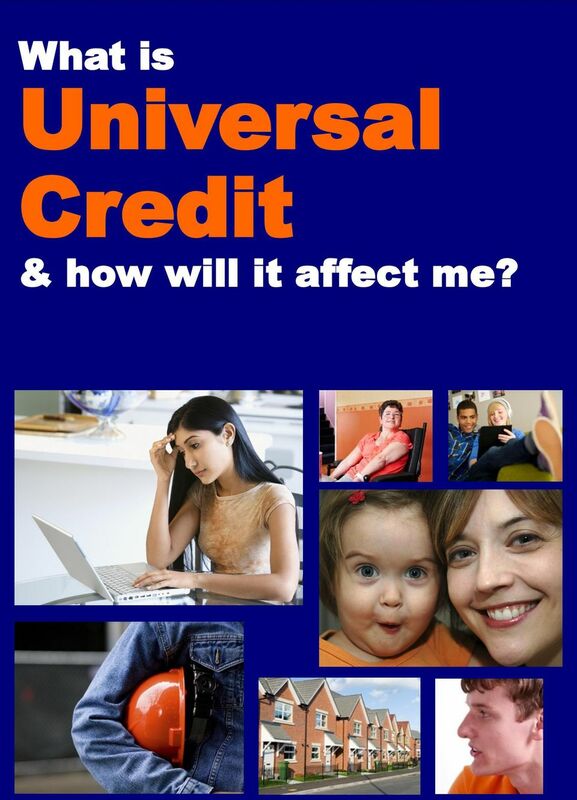 1 What is Universal Credit & how will it affect me? 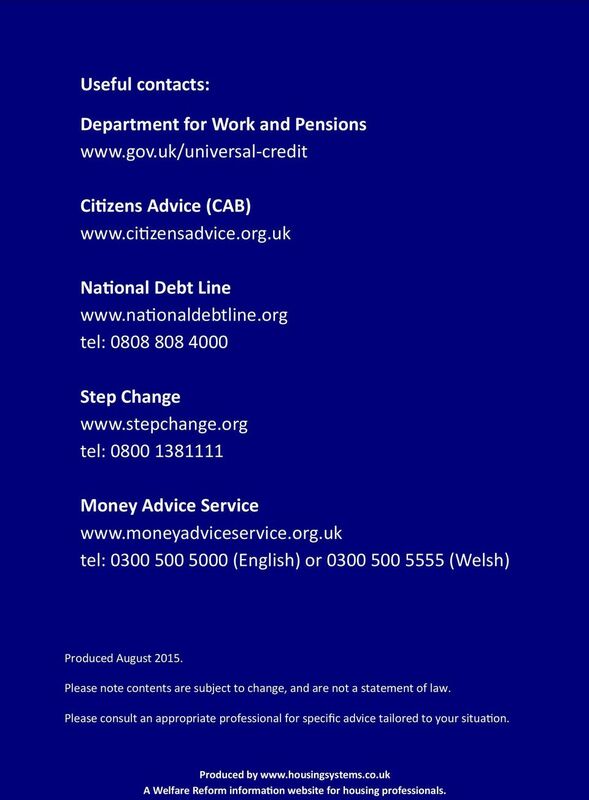 12 Useful contacts: Department for Work and Pensions Citizens Advice (CAB) National Debt Line tel: Step Change tel: Money Advice Service tel: (English) or (Welsh) Produced August Please note contents are subject to change, and are not a statement of law. Please consult an appropriate professional for specific advice tailored to your situation. Produced by A Welfare Reform information website for housing professionals. What is Universal Credit, and how will it affect me? UPDATED. XyxxYy. Benefit Changes. The Government is cutting benefits. 1 in 7 people will be affected. Are you prepared? 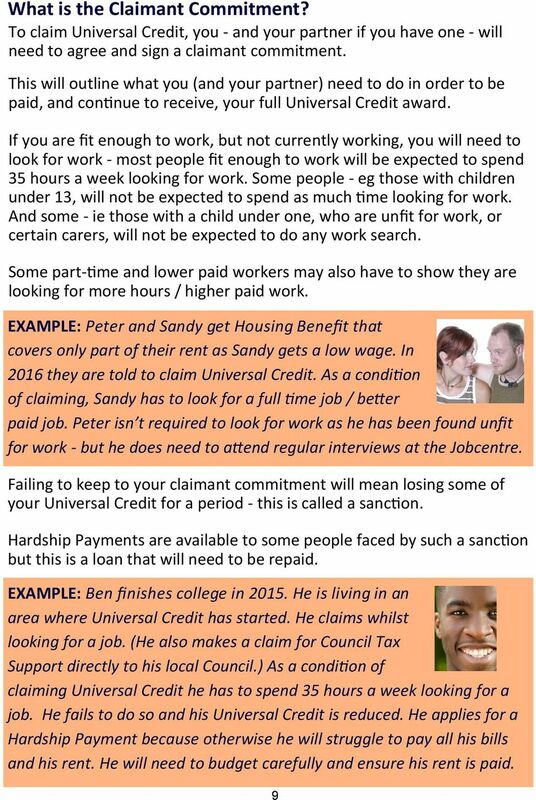 Universal Credit: an overview August 2015 What is Universal Credit? 2 Areas of the country where you can claim UC 2 Who will be able to claim UC? 3 Payment of UC 3 Making a claim 4 How is UC calculated? When is Universal Credit coming in? 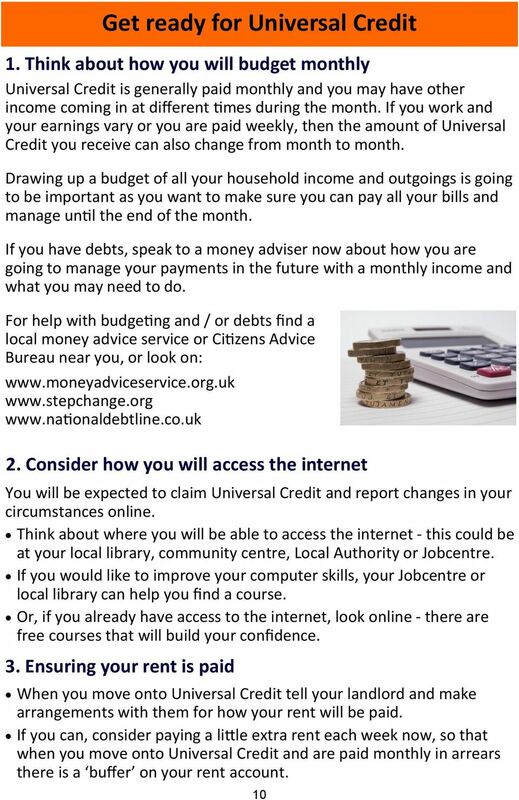 Universal Credit Universal Credit The following information gives you a simple explanation of Universal Credit, including when it is coming in, who it applies to and where to find further support and information. 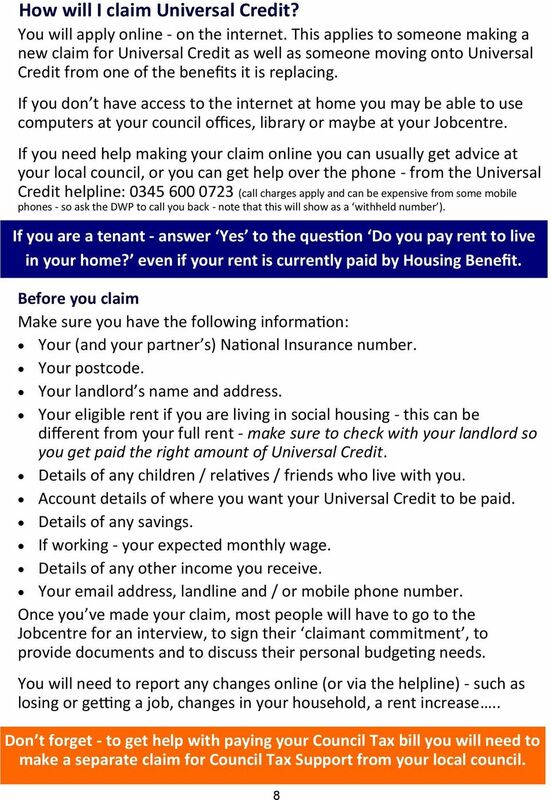 Universal Credit and Rented Housing Frequently Asked Questions 1 Contents 1. Universal Credit and the Housing Costs Element an introduction 2. Paying Rent 3. Evidence requirements and checking claims 4. Universal Credit. 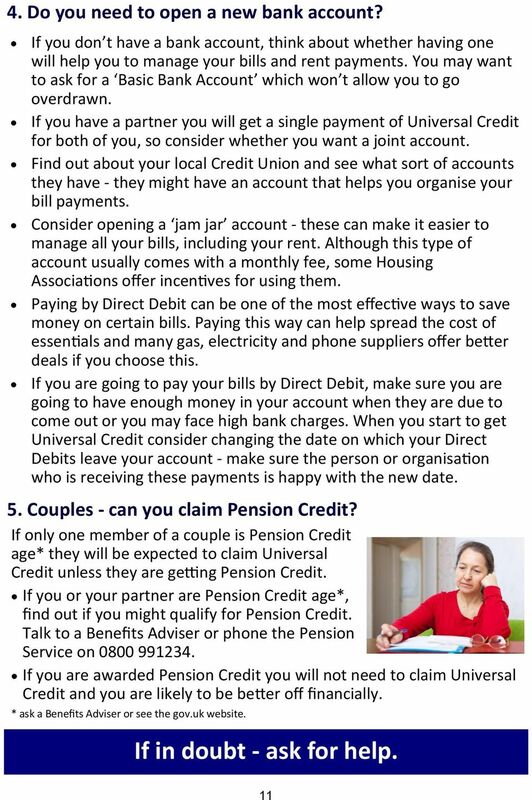 In this factsheet you can find out what benefits are being replaced by UC, who can get it and how much you could get. Get advice now. Are you worried about your mortgage? Countdown to change. Changes to the benefits system will affect many people, are you ready? Your claim journey 1. 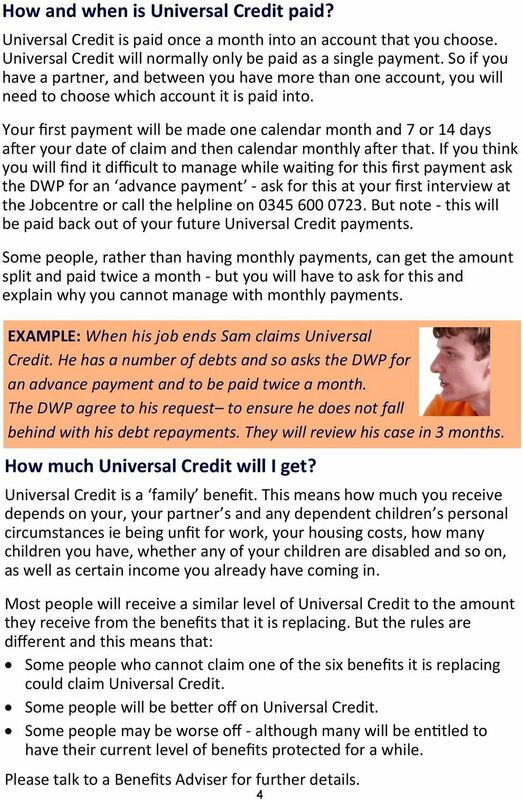 Claiming Universal Credit Universal Credit is a new benefit that supports people who are on a low income or out of work, and helps ensure that you are better off in work than on benefits. 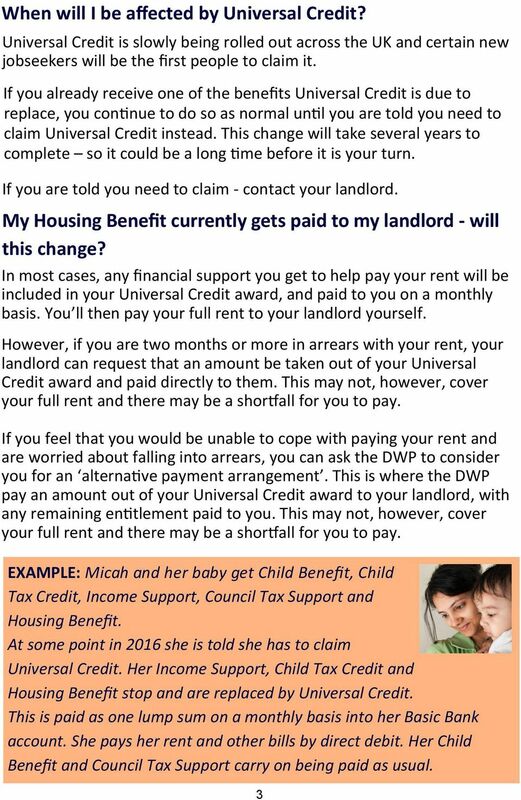 Benefits for people on a low income 1 Benefits for people on a low income If you re living on a low income, you may be able to get benefits to help with your living costs, your rent and your Council Tax. WHAT DOES UNIVERSAL CREDIT MEAN TO ME? Help yourself if you re made redundant If you ve been made redundant, this leaflet will help you find out about your rights, what benefits you may be entitled to, and where you can get more help and information. 24+ Advanced Learning Loan. England only. What happens if we ve paid you too much tax credit? 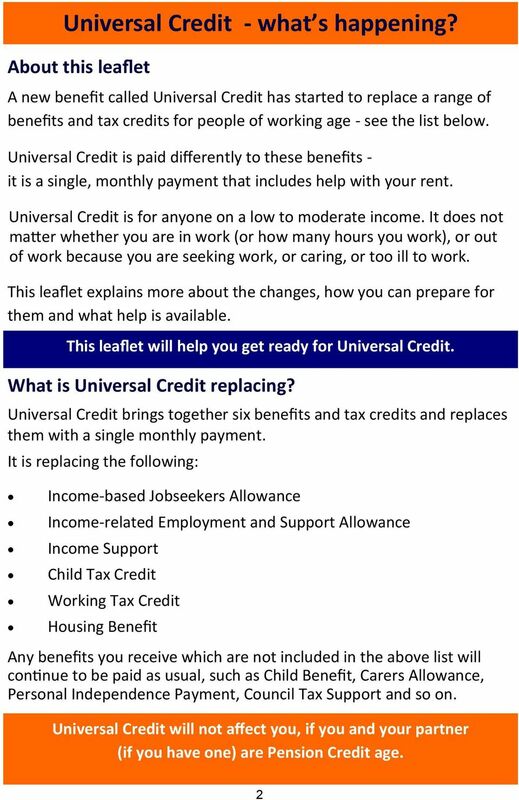 Universal Credit will be paid as a single monthly payment, direct to the customer, similar to a wage. 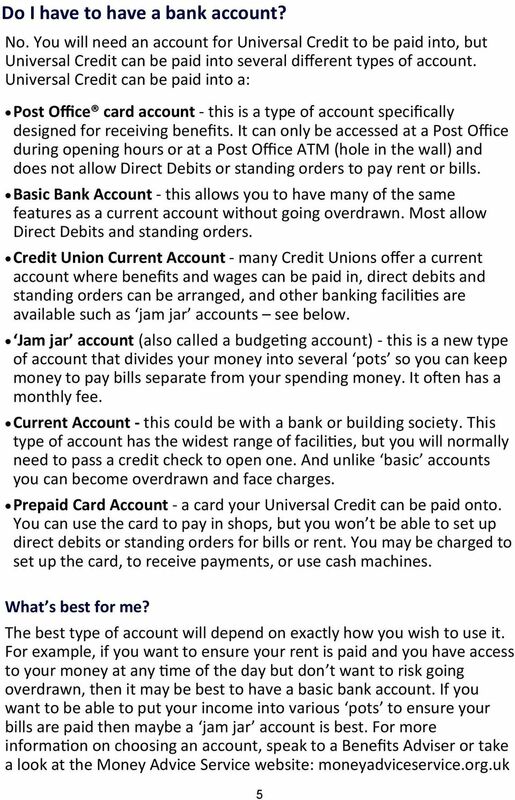 FAQ s What is Universal Credit? Universal Credit is a new benefit that will bring together six of the existing legacy benefits to simplify the benefits system and help ensure people are better off in work. 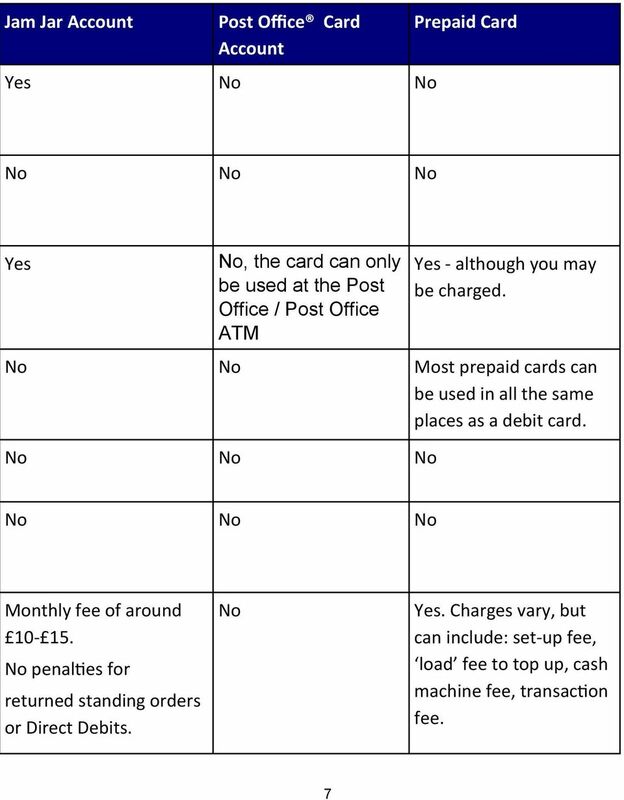 Do you have a bank or other account suitable for your needs. IT S YOUR HOME : DON T LOSE IT. 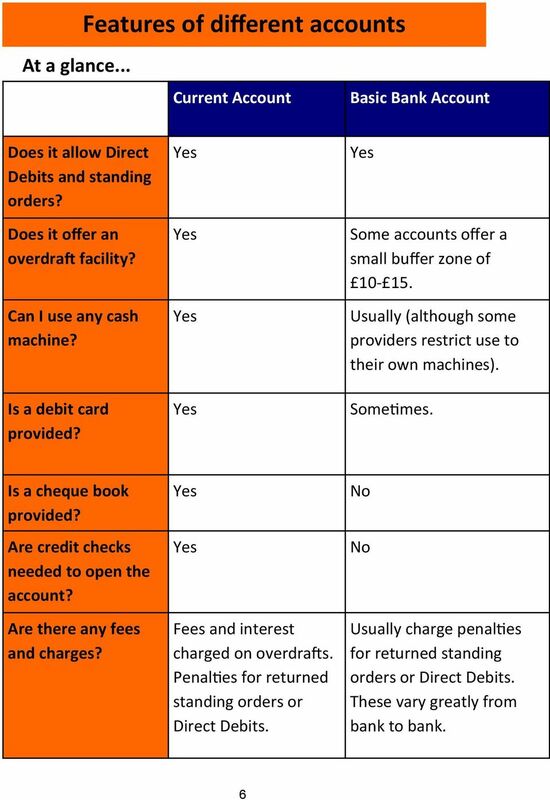 Banking made clear. Information pack for people with learning disabilities. Managing your money. Head office. Local office contact details. MySovereign app. Steps to take when dealing with debt. facebook. Help for jobseekers April 2016 Introduction This factsheet is for people of working age who are unemployed and looking for work. The main benefit in these circumstances is usually jobseeker s allowance.